What do Venezuela in 2019, Kenya in 2018 and Ivory Coast in 2010 have in common? In short, they all had two presidents. However, something different happened when Juan Guaidó declared himself interim president of Venezuela on January 23, seeking to oust Nicolás Maduro, the former trade union leader handpicked by Hugo Chávez as his successor in 2012. Guaidó not only represented a focal point of political divisions within the country itself but, in receiving the immediate support of the Trump administration, also reignited tensions on a global scale between the United States and Maduro’s long-term allies China and Russia. Maduro has been well-known in Venezuelan political circles for decades, gradually working his way up the ranks of the Chávez administration. By contrast, Guaidó is an engineer still in his mid-thirties from the northern Vargas state and was a relatively unknown politician until his election to President of Venezuela’s General (parliamentary) Assembly on January 5 this year. Instead, the most high-profile oppositional figure to Maduro’s administration has been Henrique Capriles Radonski, former governor of the Miranda region, who narrowly lost in the presidential elections to Chávez in 2012 and to Maduro in 2013. Capriles was banned from seeking public office for a period of 15 years in 2017. The media are important platforms amplifying Venezuala’s current presidential duel nationally and internationally. State television channel Venezolana de Televisión (VTV) transmits public support of Maduro, including coverage of the march of a socialist women’s collective towards Miraflores Palace in Caracas. VTV also broadcast the lengthy press conference given by Maduro on Friday in which he highlighted the strength of Venezuela’s state-owned oil and gas company PDVSA, Petróleos de Venezuela, S.A, and its ownership of subsidiary, Texas-based Citgo Petroleum Corporation, a significant supplier of the US market. Like Capriles before him, Guaidó is using social media to transmit his oppositional messages. Through Twitter, he communicates his gratitude to international supporters such as Emmanuel Macron, expresses concerns for his own safety following his challenge to Maduro’s leadership and criticises the country’s current economic and social policies. Guaidó’s self-presentation on social media has been compared by commentators to that of Barack Obama. Academic research has identified the strategic use of media by Venezuelan politicians for self-promotion and the creation of affective ties with their electorate. The Aló Presidente television show (Hello Mr. President), which ran from 1999 until 2012 every Sunday for up to six hours, featuring then president Hugo Chávez often meeting with residents of socio-economically disadvantaged neighborhoods and unveiling assistance programs to benefit them live on air, has been highlighted as a prime example of this. Aló Presidente played a fundamental role in the creation of the phenomenon of Chavismo (or Chavism), the socialist ideology championed by Chávez which also incorporated the nationalist principles of Simón Bolívar, one of the leaders of the Latin American independence movement from Spanish colonisation in the 19th century. However, Chávez also faced criticism for his role in the suppression of media critical of his administration. In 2007, he refused to renew the broadcasting license of Radio Caracas Televisión, (RCTV) an independent television station which had been in existence since the 1950s, on the basis that it had supported a 2002 attempt by members of the military to remove him from power. 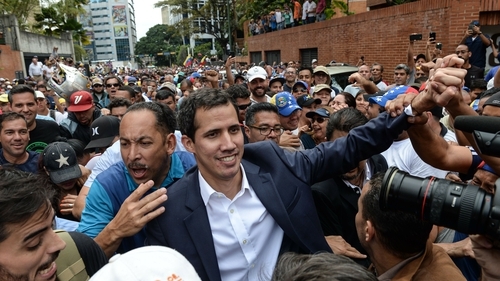 Juan Guaidó has claimed that he participated in protests as a student against the stance taken by the Chávez administration in relation to RCTV. This January, following Guaidó’s presidential declaration, criticisms of the Venezuelan government’s censorship of the media have re-emerged. US-based non-governmental organisation, the Committee to Protect Journalists, has called on Maduro’s administration to refrain from restricting internet media activities and blocking access to critical news outlets. In a message to journalists covering events in Caracas, the NGO highlighted the dangers to them of detention, prosecution and deportation. These events also highlight the changing political tide in Latin America. A decade ago, Chávez formed an ideological alliance with presidential power couple Néstor and Cristina Kirchner in Argentina and the Brazilian leader of the time, Luiz Inácio Lula da Silva. However, the movement away from left-wing politics in both Argentina and Brazil which led respectively to the election of Mauricio Macri in 2015 and Jair Bolsonaro in 2018 (and even the imprisonment of Lula de Silva on charges of corruption and money laundering) has been linked by political commentators to the recent acceleration of calls, particularly from the United States, for the end of the Maduro presidency. The measured voices calling for change in Venezuela, generally fatigued by Latin America’s history of de facto regimes and foreign interference, assert that Venezuela should be allowed to decide its own fate and leader through democratic elections. So, what else do Venezuela in 2019, Kenya in 2018 and Ivory Coast in 2010 have in common? This remains to be seen. Kenya’s two presidential declarations ended in the reconciliation of both parties on national television. For Ivory Coast, the divisions caused by the disputed presidential election led to a civil war. In Venezuela, for now, all we can know for certain is that the media coverage of unfolding events will be as divided as the presidency itself.